The ultimate top of the line 2015 Porsche 911 GT3 RS was caught on camera while performing some serious testing on the tracks. It seems that the Porsche engineers are working on a more upgraded and most powerful 911 GT3 RS, with a supercar looking more aggressive at its aerodynamics. The 2015 edition comes with other distinctive changes outside like a larger fixed rear wing, a modified rear fender with bumper air extraction paths. 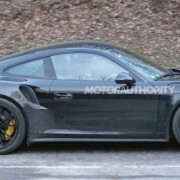 At the supercar`s side intakes, the Porsche manufacturer is using the “extra-wide body” taken from the present 911 Turbo. 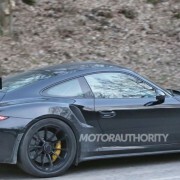 As for performances on the track, we might expect the 2015 Porsche RS coming with a more track-suited gearing, making the supercar more aggressive. As for the RS`s transmission, we are not sure if the hot super race will becoming with a manual gearbox, since the present GT3 doesn’t sport one. Talking about more power on the track, think of a 3.8-liter developing 475 horsepower, with some upgrades to make the car response easier, like a lighter internal flywheel.